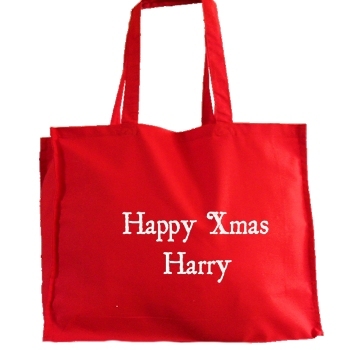 Personalised cotton tote gift bag in red that is great for Christmas as well as being sturdy and reuseable too. Each bag measures 30x40cm with a 9cm gusset, the bags are made from 100% cotton and have a flat base and gusset edge for extra holding capacity. Pack all of those special gifts into this personalised bag for that extra special personal touch maybe for those who would prefer something simple and resusable rather than the fully decorated sacks. Made from festive red fabric and personalised with beautiful embroidered text of your choice in the thread colour of your choice too! Perhaps a name, nickname, large initials or a short messsage. Please allow at least 48 hours for us to embroider your customised giftbag.